I ﻿couldn't make this up -- and I don't have to. In a post Last week, on December 30th, I said it might be my last chance to make fun of Outskirts Press boss Brent Sampson in 2010. Well, folks, we're now barely into 2011, and my Outskirts Press Stupidity Detection Alarm has already rung. and given me a reason to laugh and to write. 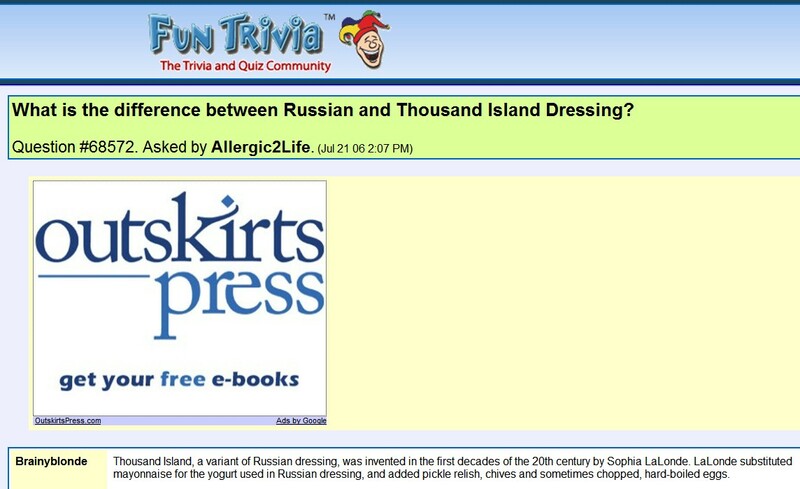 Yesterday, in order to settle an argument in the office, I Googled to determine the difference between Russian dressing and Thousand Island dressing. One of my know-it-all employees had insisted that they are the same. I disagree and decided to check the web. I got an answer (which may or may not be accurate), but up above the answer was an ad for (drum roll, please) the often-clueless Outskirts Press. What are the chances that there is a significant number of people researching salad dressing and also interested in self-publishing? A pretty slim chance, I suspect. I just Googled "Russian dressing" to get a picture to put in this blog post, and guess what I found . . .
Why does Brent Sampson have a fetish for Russian dressing? In reality, the Outskirts ads are not appearing at irrelevant and silly sites. They're appearing on sites because the one-world corporatist/communist overseers in the black helicopters have been hovering above me and detected that I have searched for websites related to Outskirts Press, or visited the actual Outskirts site. The enslaved lackeys have programmed their servers to display Outskirts advertising on sites which get paid by Google to display ads. So, what are the chances that I'd click on an ad for Outskirts Press? Somewhere between none and zero. I just Googled _incompetent self-publisher_ and encountered an ad for Outskirts Press. I had to click on it -- to cost Brent a few cents. Sadly, all of the misplaced advertising has to be paid for. This increases the cost of business, which ultimately means that Outskirts's authors get less money and readers pay more for Outskirts's books. Thank you Michael Marcus for the head's up regarding Outskirts.